The Dharmashastras are Hindu Law books about morality and religious duty. They provide guiding rules and principles for the order and regularity of society and righteous conduct. They recognize the importance of karma in creating divisions and disparities in society and prescribe methods to social friction and moral confusion. However, since they represent archaic conditions of an ancient society, some of the passages in them are bound to shock the sensibilities of many people in today's world. The Dharmashastras did not envisage an egalitarian society in which both men and women competed for the same duties, professions, and resources. Same was true with regard to caste divisions. They accepted gender and caste inequality as a social imperative and prescribed for each different set of laws. It is therefore necessary to study the law books with caution, tolerance and understanding, accepting the principles of human conduct that are still valid and relevant and examining the rest for their historical value. They belong to an age when people had different worldviews and conducted their lives based on certain beliefs, values, traditions and assumptions. It is not fair to judge them based on our contemporary values, norms and principles of social justice. On the positive side, Hinduism remained largely free from the restrictive views of the law books and marched ahead with time accommodating changes and adaptations to meet the challenges of human progress, while the law books lost their relevance, authority, and importance partly due to their impracticality in changing times and partly due to the decline in the power of Hindu rulers during the medieval period. Despite many setbacks, Hinduism continued to grow assimilating new currents of thought and transforming itself into a complex spiritual tradition encompassing a whole gamut of beliefs, philosophies, and practices. Dharma in Hinduism is a very elaborate concept with divergent meanings, which we have described elsewhere. Its primary aim is to ensure the orderly progression (Rta) of creation and existence, by preserving their foundational structure, supporting mechanism, values, order and regularity. According to Hinduism, one of the self-appointed duties of God is to protect the worlds and beings by enforcing the Dharma that is specific to each of them. The rules of Dharma are universal in the sense that their primary source is God only. However, variations arise in their implementations as they are applied at different levels and in different worlds according to the duties, roles and responsibilities prescribed to each of them. Dharma is eternal, but its enforcement and observance are subject to fluctuations according to the progression of time. Hence, they are subject to change. They are also applicable to beings who are bound to either duty or mortality, but not to those who are liberated forever. In the liberated state, the souls (muktas) enjoy eternal power in the world of Brahman, where there are no boundaries and no laws, but only all knowing awareness, and immeasurable existence that is not subject to any laws or limitations. In that eternal and infinite state, each soul governs itself, exists by itself, bound to nothing, complete, perfect and very much like God in a state of unity. The Dharma Shastras were meant for people who are bound to the mortal world, because of their ignorance, sinful karma, delusion and desires, and who engage in desire-ridden actions. For such people guidance is required for distinguishing the lawful from the unlawful, and performing such duties that flow directly from God which will ensure the orderly progression of the world and preservation of the moral, social and political order. The Dharmashastras are not products of divine revelations like the Vedas. Hence, they are vulnerable to the imperfections to which the human mind is prone. Yet, we cannot cast them away as mere intellectual works of limited vision. They were crafted with care to provide guidance from a divine perspective. In them you will find a sincere attempt to provide practical solutions to possible social anarchy, disorderliness, and moral confusion. In them you will find divine wisdom as distilled by the human mind and filtered by discerning intelligence. Hence, they are considered smriti rather than sruti. They represent the collective wisdom of spiritual teachers, scholars, rulers, and law makers who were instrumental in their creation and enforcement. The law books prescribed best possible solutions to each class of beings to pursue the four ideals of dharma, artha, kama and Moksha, but in doing so they were not completely free from the caste predilections that favored a few social classes. They betray a veiled attempt by ingenious minds to ensure status quo and preserve the social, economic and political privileges of select castes. Using the authority of God and religion, the Dharma Shastras tried to ensure the order and regularity of the world on an ongoing basis, but in that they were not completely successful as is evident from the decline of their jurisdictional power following the decline of the power of Hindu rulers in the Indian subcontinent. However, on the positive side, they created a framework to envisage ideal human conduct and standards to distinguish the right from the wrong. They laid down elaborate rules to govern human conduct and instill fear of moral and temporal authority. Some of the laws and principles of inequality prescribed in the Dharma Sutras are bound to offend the sensibilities of present day educated Hindus, who have been heavily influenced by modern western education and brought up upon the values of equality, fraternity, individual liberty and social and moral justice. Many verses in them stand in contrast to these modern values and sound retrogressive. Therefore, when you study them, suspend your judgment and weigh the knowledge from an academic or historical point of view as a work in progress. It is unwise to use them as a reference to justify any social or gender inequality in today's society or make an argument that we must draw inspiration from them to regulate our social conduct. You may take from them a few principles that are still valid in the present day world and observe them in your life, but you may not use it as a justifiable point to argue their universal adaptation. Some critics of Hinduism use the law books to denigrate Hinduism and cast aspersions upon Hindu society. 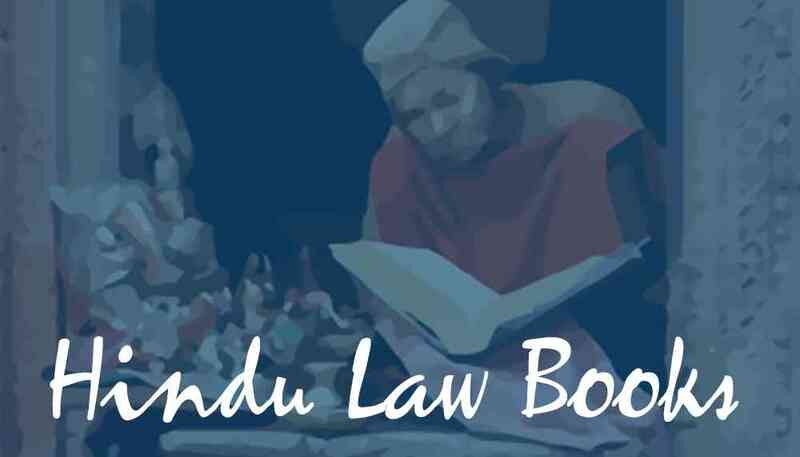 Since present-day Hindus follow common civil code rather than the law books such attempts must be countered at every level. Humanity advanced to the current stage through many dark periods of history. Human civilization was never perfect. We made progress through trial and error, learning from our mistakes and failures and making amendments with the past. Therefore, to judge Hinduism based upon the law books would be similar to judging today's American based upon slave practices of the 18th century or the Europeans based upon inquisitions and religious persecutions of the medieval period. Hinduism has come a long way from the days of the Vedic people and from the ancient practices of human and animal sacrifices. Despite such dark spots in its long history, overtime Hinduism managed to resolve the inconsistencies and anachronisms of its past and morphed into a tradition with a strong spiritual base and broader appeal. It became possible due to the untiring works of numerous souls, who sculpted the tradition as an expression of the highest in the intelligence of man and the best in the vision of God. Such people are active even today, preparing Hinduism for the coming generations, to meet the expectations of those who would scientifically be well prepared and spiritually well advanced. The silent revolution within Hinduism has still been going on, despite attacks from within and without to embrace the future that is shaping itself in the womb of the earth. Hinduwebsite salutes all those who are trying to redefine Hinduism and making it more relevant to the complex contemporary world as well as the coming ages.